In the early modern period, the religious fervor of the Reformation and Counter-Reformation, social unrest, and millenarianism all seemed to foster greater anti-Judaism in Christian Europe, yet the increased intolerance was also accompanied by more intimate and complex forms of interaction between Christians and Jews. Printing, trade, and travel combined to bring those from both sides of the religious divide into closer contact than ever before, while growing interest in magic and the Kabbalah encouraged Christians to study Hebrew in addition to Latin and Greek. In Hebraica Veritas? 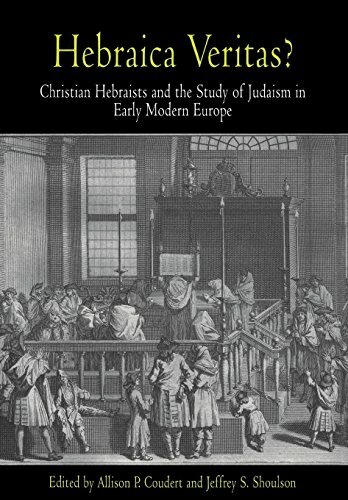 Christian Hebraists and the Study of Judaism in Early Modern Europe, noted scholars trace how these early modern encounters played key roles in defining attitudes toward personal, national, and religious identity in Western culture. As Christians increasingly patronized Jewish scholars, in person and in print, Christian Hebraism flourished. The twelve essays assembled here address the important but often neglected subject of the early modern encounter between Christians and Jews. They illustrate how this envolvement shaped each group's self-perception and sense of otherness and contributed to the emergence of the modern study of cultural anthropology, comparative religion, and Jewish studies. But the chapters also reveal how the encounter challenged traditional religious beliefs, fostering the skepticism, toleration, and irreligion conventionally associated with the Enlightenment. Many of the Christian Hebraists described in these essays were linguists and textual critics, and their work highlights the ambiguous role played by language and texts in transmitting natural and divine truth. It was during the early modern period that numerous concepts underpinning modern Western secular society came into existence, and as Hebraica Veritas? shows, the subject of Christian Hebraism has direct relevance to understanding the intellectual changes and challenges characterizing the transition from the ancient to the modern world. Allison P. Coudert is Professor of Religious Studies at Arizona State University. She is author of The Impact of the Kabbalah in the Seventeenth Century: The Life and Thought of Francis Mercury van Helmont, 1614-1698. Jeffrey S. Shoulson is Associate Professor of English and Director of the Program in Judaic Studies at the University of Miami. He is author of Milton and the Rabbis: Hebraism, Hellenism, and Christianity.